Home > Updates > Back pain and spondylolisthesisback pain is very common. back pain is of two types mechanical and non mechanical. mechanical back pain increases with activity and gets better with rest and most common cause of mechanical back pain is slip disc. non mechanical back pain is usually caused by infections and tumors and is characterized by night pain and pain not improving with with rest.one of the common cause of back pain in elderly population is lumbar Canal stenosis and spondylolisthesis. spondylolisthesis is slippage of one vertebra over the another. this causes nerve compression and produces sciatica like symptoms. the patients with spondylolisthesis are usually females in the age group of 40 to 60. typing in these patients increases with activity like turning in bed getting out of bed or getting up from forward bend position.relation to back pain these patients have leg pain numbness paraesthesia or tingling which increases with walking and Standing and gets better with sitting. treatment of spondylolisthesis is initially non-surgical involving medicines Physiotherapy belt and rest. majority of cases improve with this. few patients who do not improve with this need fusion surgery. infusion surgery screws of place in the vertebral bodies. 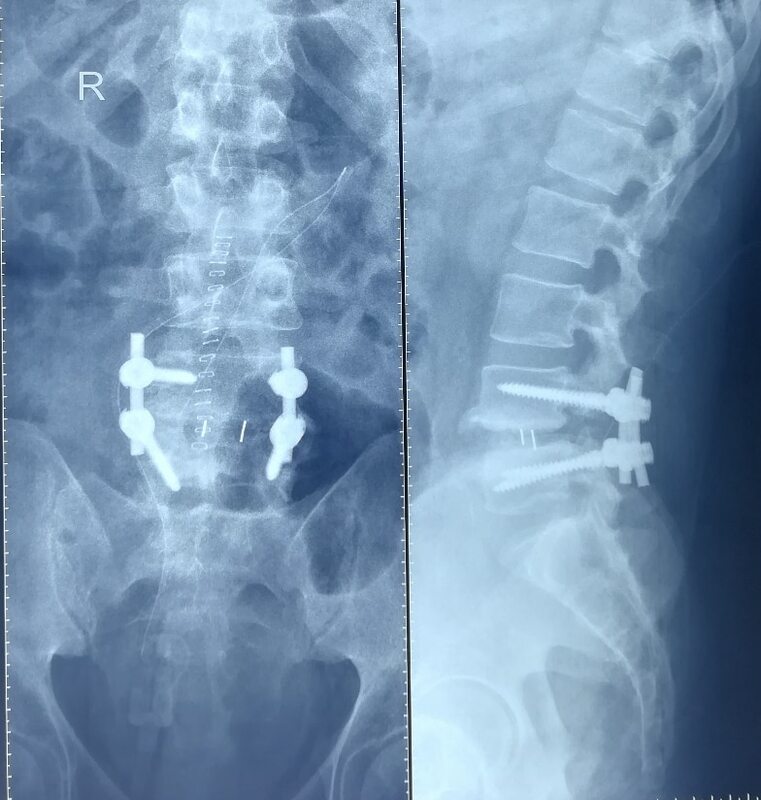 the disk is removed and Titanium or PEEK spacer is placed.Presenting here a case of 53 year old Iraqi male patient who had back pain with left lower Limb pain for last 4 years he was not able to sit or stand for more than 15 minutes. His MRI showed L4 L5 spondylolisthesis. He underwent transforaminal Lumbar interbody fusion or TLIF. Back pain and spondylolisthesis back pain is very common. back pain is of two types mechanical and non mechanical. mechanical back pain increases with activity and gets better with rest and most common cause of mechanical back pain is slip disc. non mechanical back pain is usually caused by infections and tumors and is characterized by night pain and pain not improving with with rest. one of the common cause of back pain in elderly population is lumbar Canal stenosis and spondylolisthesis. spondylolisthesis is slippage of one vertebra over the another. this causes nerve compression and produces sciatica like symptoms. the patients with spondylolisthesis are usually females in the age group of 40 to 60. typing in these patients increases with activity like turning in bed getting out of bed or getting up from forward bend position. relation to back pain these patients have leg pain numbness paraesthesia or tingling which increases with walking and Standing and gets better with sitting. treatment of spondylolisthesis is initially non-surgical involving medicines Physiotherapy belt and rest. majority of cases improve with this. few patients who do not improve with this need fusion surgery. infusion surgery screws of place in the vertebral bodies. the disk is removed and Titanium or PEEK spacer is placed. Presenting here a case of 53 year old Iraqi male patient who had back pain with left lower Limb pain for last 4 years he was not able to sit or stand for more than 15 minutes. His MRI showed L4 L5 spondylolisthesis. He underwent transforaminal Lumbar interbody fusion or TLIF.